A few weeks back I got to work with some of my talented event industry friends for a night of great food and entertainment. Judy Cordell of Judy Cordell Events pulled together some amazing talent for the Lone Star Dinner, a farm to table dinner, held at Avalon Legacy Ranch and catered by the talented, George Brown Jr of Experimental Table. Avalon Legacy Ranch is a beautiful space outside McKinney, owned and operated by my good friend Debbie Ladd and was the perfect venue to showcase chef Brown's talent. Her space was made even more stunning by the floral provided by Diane France of Fleurs De France Florals. As one of North Texas' best event planners, Judy, knows how to throw a party! Judy, understands the importance of great design and how to make that important first impression, so naturally the invitation was key. 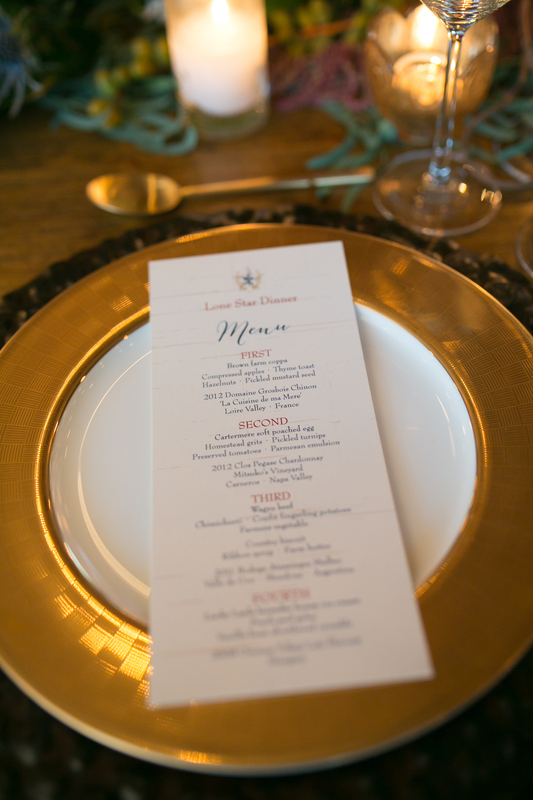 We worked closely to capture the aesthetic and menu for the evening in the design. Color conveys meaning, so remember that brides! 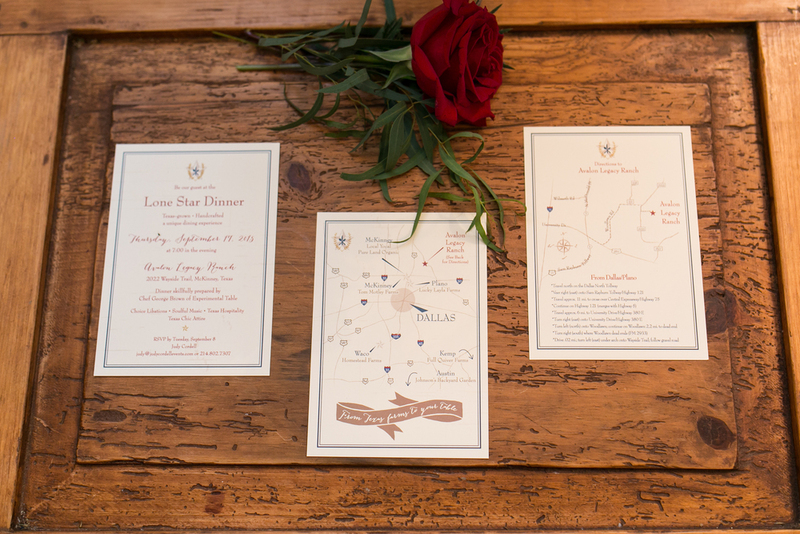 Once we settled on an invitation I went to work on all the little touches that make an event special. From place cards and menu's to totes and labels I utilized our color palette to bring cohesiveness to this beautiful event. We even created a map outlining all of the local farms that provided the ingredients for the dinner. The totes filled with goodies from local businesses and farmers and printed by the lovely Kristen Gilbert at Collin County Canvas, featured the detailed map. The night was a success and really showcased the best of McKinney. I was grateful we were able to participate. Please check out the photo's below taken by my good friend and extremely talented photographer, Julie, of Phase3 Photography.